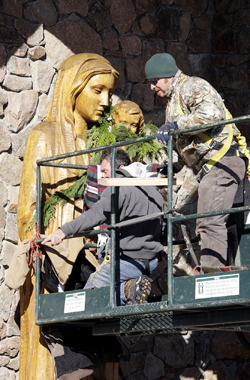 Leni McFenster, left, and Brian Nelson, right, help affix a wooden sculpture of the Virgin Mary holding baby Jesus on the front of Our Lady of the Snows Catholic Church in Sun Valley last Thursday. Fondly known as ?Our Lady of the Cold Toes? for the Virgin Mary?s bare feet, her placement signals the near completion of the new church?s construction. Built of glass, wood and stone, the new church is 15 feet taller than its predecessor, which was built in 1969. It will seat approximately 400 people. On Thursday, Dec. 13, at 4 p.m. there will be a dedication of the new building, with Bishop Michael Driscoll as well as invited clergy in the valley attending. ?There will be music from our own choirs and from other churches, with a reception to follow,? said Theresa Gregory, parish life director for the church. Everyone is welcome. People should gather outside in the parking lot before 4 p.m.
Consolidated dispatch soon a reality? Defense attorney to allege ?prejudicial pretrial publicity? Should an employer pay for alcohol at the holiday party? Journey to the ?Land of Snow?